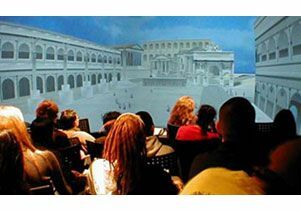 Students in UCLA's Visualization Portal take in a dramatic view of the 22 buildings and monuments of the Roman Forum as they likely appeared in 700 B.C. A spherical, floor-to-celing screen virturally immerses viewers in the scene. Archaeologists believe that the Inca marked the summer solstice by watching the sun move through a series of astronomical markers along the shores of Lake Titicaca between Peru and Bolivia. But this ritual is hard to envision centuries later because the site lies in ruins. Santiago de Compostela, a medieval cathedral in northwestern Spain, was once a popular destination for religious pilgrims. Yet today, little is left of its ancient architecture that suggests its allure. And how can one experience the richness of the Roman Forum at its apex when only two of its 22 structures have survived intact? A team of UCLA scholars and students has figured out how to reclaim from antiquity such lost treasures and restore them to their former glory by harnessing the power of virtual reality. The team is breathing new life into the crumbled remains of such structures as the Inca Temple of the Sun, Santiago de Compostela, the Roman Forum and more than a dozen other cultural heritage sites around the globe. 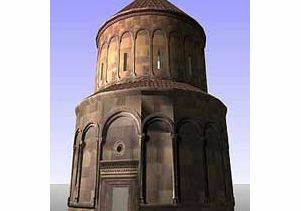 Using flight visualization technologies, 3-D imaging software and the same kind of digital magic used by movie studios, UCLA’s Cultural Virtual Reality Lab (CVRLab) has created large-scale digital models that allow viewers to “walk” through monuments that today lie in ruins, have eroded beyond recognition or have disappeared altogether. Their 3-D creations are much more than colorless, flat architectural sketches. Time travelers can experience such telling details as the play of light across long-vanished surfaces and the haunting echo of speeches and songs in halls that no longer exist. The experience is especially vivid when the models are shown in UCLA’s Visualization Portal, a state-of-the-art screening facility built by Academic Technology Services for campus researchers. With a floor-to-ceiling spherical screen and an immersive virtual reality display, the portal produces an effect similar to IMAX movies with one key exception: Viewers actually can pick their own course of exploration. “This is a kind of cultural time machine that explores the prime real estate of human history,” said Bernard Frischer, a professor of classics and the lab’s founder. 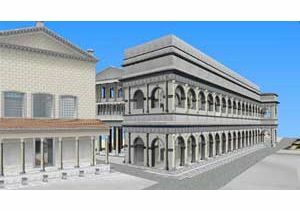 Last month, the lab unveiled its most ambitious project to date, a re-creation of 22 buildings and monuments in the Roman Forum. Three years in the making, the Virtual Forum is based on the most up-to-date research of the most studied archaeological site in history. Viewers can explore the temple site where Julius Caesar’s corpse was cremated, the senate chambers where the chief apologist for Rome’s pagan state religion delivered what’s been called “perhaps the noblest defense of a dying creed that has ever been made” and a monument marking the point of convergence of all major roads leading out of ancient Rome. “This is by far the most complex digital model that has ever been created of an archaeological site,” said Frischer. 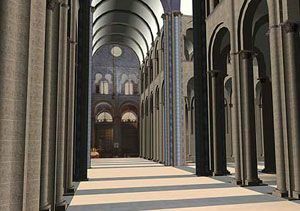 Along with an earlier reconstruction of the Roman Colosseum, the Virtual Forum is the centerpiece of Rome Reborn, a long-term project to re-create digitally thousands of structures from early fifth-century Rome. “Soon we will be able to give people the experience of walking down the streets of an actual city as opposed to hopping around from isolated spot to isolated spot,” Frischer said. That goal came closer to reality last month when the lab received $750,000 from the Andrew W. Mellon Foundation. Meanwhile, a new $250,000 grant from the National Science Foun-dation will allow the CVRLab to beef up its Web site. Each model represents a synthesis of the most advanced research done on any given site. To create the Virtual Forum, the team layered three maps of architectural remains going back to 700 B.C. 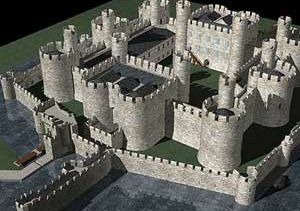 The model for each building was based on the most widely accepted two-dimensional plan. Typically, the plans represent years — sometimes decades — of research by leading scholars. When details were lacking in one plan, modelers turned to competing plans, or they filled in the gaps with hypothetical segments based on comparable structures. “We keep very careful notes so if there’s an excavation that unearths new data, we can make adjustments,” said Diane Favro, an architectural historian and the lab’s co-director. The final step is an evaluation by independent scholars who have conducted research at the site. “They sign off, saying, ‘This is as accurate as it can be, given the knowledge we have today,’” Favro said. Still, the models are never 100% complete. “You can always add more as more information or new technology becomes available,” Favro said. Other completed projects include a villa in Pompeii, a medieval Armenian church in Turkey, one of Rome’s first Christian churches, England’s Beaumaris Castle and a 3,000-year-old horse stable that may have belonged to King Solomon. The lab is poised to model Bolivia’s Temple of the Sun and the Grand View Garden, a fictional garden prominently featured in the beloved 18th-century Chinese novel “A Dream of Red Mansions.” The Titicaca model will be based on research by Charles Stanish, director of UCLA’s Cotsen Institute of Ar-chaeology, while the Chinese model will use the research of Richard E. Strassberg, a professor of East Asian languages and cultures. “The whole experiential aspect of architecture is something that hasn’t been taught or researched in as great a depth as it deserves because there hasn’t been a tool — until now,” Favro said. John Dagenais, a professor of Spanish and Portuguese, conceived of a virtual Santiago de Compostela as a teaching aid for a course on medieval literature inspired by the pilgrim route. “I wanted my students to have a sense of that culminating moment when religious pilgrims first entered the cathedral after months of travel,” Dagenais said. The model inspired undergraduates to conduct their own original research. While in a summer-abroad program in Spain, they gathered photographs and detailed notes on sections of the cathedral. Back in Westwood, graduate students in architecture are feeding the information into the model. The digital models themselves have become invaluable tools for research. Because 3-D software can take into account building materials and the laws of physics, scholars can examine construction techniques in ways sometimes overlooked when they are working with drawings. For example, one doctoral student challenged conventional wisdom about the Colosseum, long regarded as a masterpiece of circulation because people could supposedly enter and find their seats in as little as 10 minutes. But while digitally reconstructing the arena, graduate student Dean Abernathy discovered bottlenecks that would have stalled visitors in the upper sections for lengthy periods, suggesting a two-tier circulation system that favored affluent patrons in the choice, lower seats. Scholars can also use the models to study the effects of light, sound and other transitory conditions. Using models of the Temple of the Sun and a gigantic Egyptian obelisk that reputedly served as a sundial in Roman times, scholars want to track the probable path of the sun. Recently installed software now makes it possible to hear how medieval music would have resonated in Santiago de Compostela. See the wonders re-created in the lab at www.cvrlab.org.